During your vehicle’s road travel, it can experience unintentional collisions–with either big or small impacts. When driving at 55 mph down the highway, even a small pebble can cause an unsightly blemish to your windshield. Depending on the size of the pebble, it could be much worse than a blemish. Whatever the degree of damage that occurs to your windshield, you’ll need an expert auto glass repair technician to fix it. Our team is experienced at handling all the auto body repairs resulting from major collisions to minor impacts. That includes the all-important windshield restoration. Continuing to drive with a slight crack in your windshield is dangerous and very distracting. An auto glass crack that has been caused by the smallest pebble can grow to severely compromise the safety of your vehicle. 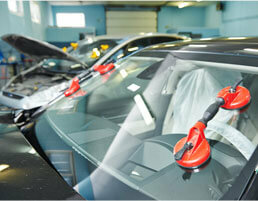 We use the latest technologies when performing any of the necessary auto glass repairs for your vehicle. Let our experts restore your vehicle’s glass so you continue to experience a fully-secured cabin. Trust our years of experience and training for any questions or concerns you might have about your vehicle’s auto glass repair options. The expert technicians at Scott’s Body Shop are in the business of returning vehicles to their original conditions, without a spot or blemish. That includes any of your auto glass repair needs. When you bring your vehicle to our body shop, we get perform quick and complete auto body repair solutions. We understand that any visit to our shop is never under the best of circumstances. But we want our customers to leave their worries about their auto glass repairs at the door. We’re going to get your vehicle back on the road, looking and driving like a million bucks. Your vehicle’s auto glass repair needs will be handled completely at an affordable rate, and they’ll soon be a distant memory. We look forward to seeing you drive away behind the security of fully repaired auto glass. Schedule Your Auto Glass Repair Today! Today is the day to finally take care of that pesky crack or chip in your vehicle’s glass. Although cracked glass does not stop you from being able to drive, it does compromise you and your passenger’s safety. Give us a call today at 231-796-6006 to get your vehicle’s auto glass repair work performed. Our team is anxiously awaiting your call! You can go ahead and schedule an appointment right now while you’re already online. Just use our convenient online scheduling system to pick a date and time that works for you!